Sloane Price’s last sliver of hope disappeared the day that her older sister, Lily, took off and broke her promise that they would leave their abusive father’s house together. Sloane is prepared to escape from her pain permanently when the world erupts into chaos. Zombies are everywhere, and she ends up taking refuge in Cortege High School with some of her fellow students. As the group fights, sometimes among themselves, to see another day, Sloane continues to struggle with her despair. Finding something to live for before the zombies was difficult enough, and now, with no end to the mayhem in sight, Sloane faces an even tougher battle to summon the will to survive. I think the best way to sum up how I feel about this book is with: it’s not you, it’s me. There’s nothing overtly wrong with This Is Not a Test; it just wasn’t my kind of read. I couldn’t get into the story or connect with any of the characters. As I read, it seemed as though there was a distance between the book and me, and that distance was never bridged. I found the characters in particular difficult to form any kind of attachment to. They all garnered my sympathy for the situation they were in and for the losses they suffered, but my investment in them failed to go beyond that. No one stood out to me and commanded my attention. I also had a hard time processing Sloane’s mind-set once the zombie apocalypse began. Granted, she had a horrific home life before, and the fact that she wanted to end her life because of it was heartbreaking. But once she’s barricaded inside the school, she continues to dwell on her sister leaving and to feel that she has no reason to go on. I think my brain couldn’t reconcile Sloane making it to shelter in the first place only to plan on walking out and letting the zombies infect her. I expected a different reaction, for her to be as consumed with fear of the undead as her classmates were and for her survival instinct to kick into high gear. It’s interesting that Courtney Summers chose to have Sloane act this way, sort of opposite to what might have been anticipated. For me, though, it created an incongruity in my head that I couldn’t move past. The world has been altered forever, but that isn’t enough to break Sloane out of her pre-apocalypse thought pattern. If you’ve read other reviews of This Is Not a Test, then you probably know that the zombies are rather secondary to the story. Instead, the novel focuses on the dynamics within this group of teenagers who’ve been thrown together under extreme circumstances. Summers builds some great tension-filled scenes that make you wonder whether the survivors are going to turn on each other before help arrives or the zombies manage to breach their makeshift sanctuary. To me, the unpredictability of the plot is the strongest aspect of the novel. Summers keeps you guessing as to whether the zombies outside the doors are the biggest threat, or if the frayed nerves of the weary, frightened teenagers are going to prove to be their undoing in the end. I know this review is all over the place, but so were my thoughts when I finished reading this book. It simply didn’t work out for me, but that shouldn’t discourage anyone from giving it a try. If you’re looking for an all-out zombie fright-fest, then you should probably look elsewhere. If, instead, you’re in the mood for a dark, intense read that examines how people are driven to survive in the face of catastrophe, then this might be worth checking out. I've heard great things about this one, but I didn't know that has zombies in it, which is my least fav paranormal creatures. It is safe to say that I'll pass this book. I haven't read a lot of zombie books and figured I'd try reading about a different paranormal creature for a change, but this book is more like a character study than a horror story. In general, I'm not a big zombie fan; I'm way too squeamish to watch TV shows or movies about them. 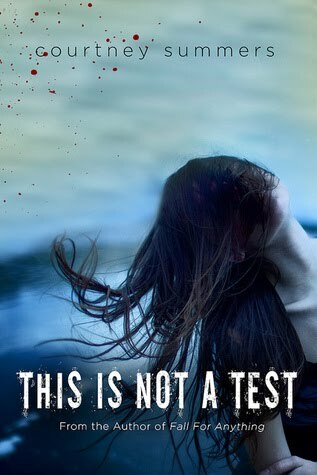 I really liked This Is Not a Test when I’d first finished it, but now that it’s been a few months I’m not nearly as impressed, especially after reading Summers’ contemporary novels. I feel like, even though the characters in this book were intentionally unlikable (it’s kind of Courtney Summers’ thing), I didn’t connect with them in the way I feel I could have. Like you said, the investment wasn’t there. Also: the ending. I’m still not sure what to make of it. If the investment hadn't been missing, I think I would have liked this a lot more. I like being challenged by characters who are purposely unlikable, but with this group, I couldn't muster any feelings about them, positive or negative. I didn't know what to think of the ending, either. It definitely caught me by surprise. Gah! I don't like zombies and this one sounds like a drag. Take Renae's tip, maybe you'll like her contemp novels better. I do plan to check out Courtney Summers's contemporary novels because I did like her writing. Ally and Melissa are zombie fanatics, so I think I'll leave reading these types of books to them. The only zombie book I like is Warm Bodies, I've still got to try Undead, which is supposed to be funny and might take away my apprehension of brain eating peeps. This doesn't sound tempting enough...even Warm Bodies had to have a 'quirk' to make me read it :) This one sounds like it would be hard work for me to read. Great review. I've seen the trailer for the movie adaptation of Warm Bodies and think that I would like to try reading the book. At times I did feel like I was laboring to get through This Is Not a Test. If there had been brain eating, I would have been extremely grossed out, but at least it would have piqued my attention. I really liked it, but I kept waiting too for Sloane to snap out of it. Plus, the ending was way too ambiguous for me. Great review! I understood that Sloane's home life was horrible, but with the whole world now collapsing around her, I just thought that she'd react differently. And the ending was certainly not what I was expecting.